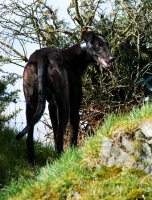 Rio is a handsome black ex-racing greyhound with a couple of white markings. He was born on the 20th August 2002 making him 3½ years old. He weighs 69 lbs (31.4k), is inoculated and we believe he is nice and easy going, very laid back, walks well on the lead and is clean in his kennel so should be fairly easy to house train. 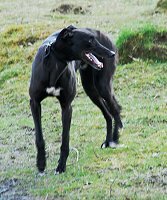 We collected Rio last night after the Dumfriesshire Greyhound Rescue AGM. Before the meeting we walked our dogs round the car park with him so they could say hello and after the meeting when we went to put him in our car he happily jumped in with them. It was late when we arrived home so we stayed up another couple of hours to settle him before going to bed. Stairs were no problem and to begin with he just wanted to explore, however, as it was late and we wanted to go to bed we blocked off our bedroom door so he couldn't get out the room. Finding he was restrained from wandering he quickly settled to his bed and slept through till about 4am when he started pacing the floor so we let him out. This morning he settled with the others waiting for his dinner then lay on the floor and slept. He is so laid back and relaxed we feel as if we've had him a week not less than a day. By lunch time he was walking round the garden with the others off the lead. As it was a lovely day I spent a couple of hours trying to sort out some flower beds and Rio joined me - just walking around, laying near where I was gardening or following me about as I was working. He has a lovely friendly face, a sweet nature, walks well on the lead and loves wagging his tail everytime he sees us. A couple visited this afternoon with their two small sons to see Rio with the possibility of re-homing him. Rio got on well with the children and was quite content to lay on the floor and let the eldest stroke him. Rio has settled into our routine quickly but eats his food quite fast, which may be due to him being in kennels where it's a case of 'the quick and the hungry'. Others have been like this but once he realises the others won't eat his food he will soon settle down. We've had no accidents from him in the house but he seems to think our conservatory with it's tiled floor and plant pots is his 'yard' because he's had three accidents in there. Hence, we now make sure he goes outside the minute he finishes his food and we don't leave the door from the conservatory into the kitchen open for him to wander out there without us knowing. This evening Lester went to training classes so we took Rio as well to be a calming influence and to test him amongst other dogs. To say we've only had him three days he did us proud. He got on well with all the other dogs, walked nicely round the hall walking to heal, did the walk and turn on the spot, stood still for a minute using the stay command, walked out the hall and back in again behind Stuart then he was let off the lead to do recall and he came back to his name when Stuart called him. He was really good. Rio loves wandering around the garden and because it was such a nice day we left the conservatory door open so he could wander in and out the house with the others. We've had large bones around the past few days and he loves taking one to his bed and having a good chew - he's good because he will let us take them off him without complaining. We discovered this evening he loves to play with toys but can be a little boisterous when its his turn to take one off you, but then, that's just excitement at being played with and again should settle down in time. Rio went to the vet this morning to be neutered. He was very good and never bothered about waiting or going in to see the vet, however, he wasn't too keen on having his pre-med injection. When we called to collect him this afternoon he was pleased to see us but this evening he was feeling a little sorry for himself and just wanted to lay on his bed near to where we were sitting. Rio enjoyed his day out today. We were going to go to Haverthwaite Railway Station to take some photographs for the calendars but it was raining heavily so we phoned the Crown Inn and asked if we could take some photographs there instead. As Rio was neutered yesterday he was able to rest most of the time in front of the fire, which he enjoyed. This morning we took Rio to his new home in the Kendal area where he will be living with a couple and their two young sons. It was the first time Rio had been in the house but he quickly settled down to play with the children and his new toys and we hope he will have a long and happy life there. Phoned to see how Rio was again this evening to find him settling in. He's been playing tug-o-war with his new toy and his owner. He's also worked out that if he plays the same game with the little boy then he must be a lot more gentle. He's had a couple of accidents in the house but as we got him straight from the kennels and only had him a week then that was to be expected, especially as he was in another new home so soon after arriving with us. This afternoon we did Rio's follow up visit and when we arrived he came to the door and gave us a lovely welcome. Inside the house he came over for cuddles, he looked well and his coat, although still quite thick was beginning to have a lovely shine in places. His new plastic toys have been replaced with rubber ones and loves his rubber ball, which he throws to himself to catch and his blue rubber bone, which he carries around in his mouth wherever he goes. 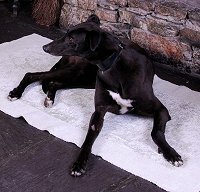 This morning Rio came with us to Ferry Nab so we could take his photograph for the ' Greyhounds and Lifestyle' calendar. The weather wasn't too good but between the showers we managed to get a lovely photograph of him with Kaz, his model for the day standing on the end of the jetty and, because of the weather, and Rio's laid back nature we only stayed an hour or so, just long enough to get 'the' picture. It was lovely to see him again and he was looking well. Heard this morning that Rio seems very happy and is enjoying his daily runs on the golf course with the collie who lives next door.